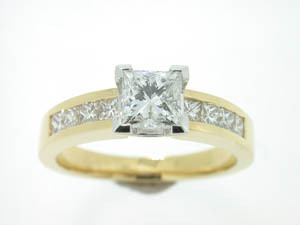 Ladies 18ct Yellow and White Gold Diamond Set Ring. Coloured Stones Rings Ladies 9ct White Gold Large Cushion Check Cut Blue Topaz Ring. Ladies 9ct White Gold Large Cushion Check Cut Blue Topaz Ring.